April 26, 2015  Every answer to today's puzzle is a familiar two-word phrase or name in which the first word starts with L-O and the second word starts with G.
April 19, 2015  For each word starting with "W," think of another word, also starting with "W," that can follow the first to complete a compound word or a familiar two-word phrase. April 12, 2015  For each word or phrase given, remove some of its letters so that those that remain, reading from left to right, will name a popular TV show, past or present. April 5, 2015  Every answer is a made-up, two-word phrase in which the first word has seven letters. Drop its first and last letters to get a five-letter word that is the second part of the phrase. March 29, 2015  The challenge is a game of categories based on the word "watch." For each category provided, name something starting with each of the letters W-A-T-C-H.
March 22, 2015  For each word given, name another that can follow it to complete a compound word or two-word phrase. The last and first letters of the first word must be the first and second letters of the second. March 15, 2015  "Yes" is supposed to be the most pleasing word in the English language. 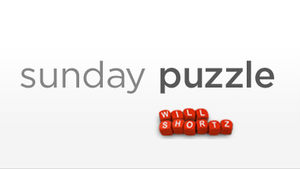 If that's true, today's puzzle will be very pleasing indeed. Each answer is an anagram of "yes" plus two or three other letters. March 8, 2015  Letters that start the name of a city are combined with letters that start the name of its state to spell a word. What are the city and state? For the word "latex," the answer would be Laredo, Texas. March 1, 2015  Rearrange the letters in a four-letter word and a five-letter word to get a pair of synonyms. For example, given "time" and "night," you would say "item" and "thing."